This Monday will see the launch of the UN DESA’s World Economic Situation and Prospects report for 2019. Produced by UN DESA every year, the report takes the temperature of the global economy and analyses its impact on our chances to achieve the global Sustainable Development Goals (SDGs). The report also looks into the planet’s social and environmental situation and how it influences the economic growth prospects. As we usher in the new year, we find ourselves in a world fraught with uncertainty and challenges. On the surface, global macroeconomic indicators remain favourable, but they mask underlying risks and imbalances. The global trade disputes are intensifying, monetary policies are shifting and climate risks threaten to undo decades of development gains. These are just some of the factors that endanger not only our current economic activity but could also negatively impact longer-term development. What is more, economic growth is uneven, often not reaching the people that need it the most. In many countries, per capita income is continuing to decline and poverty rates remain high. If we want to achieve the ambitious goals of the 2030 Agenda for Sustainable Development, we have to look past the headline economic figures and build growth on sustainable foundations. The world is in urgent need of concrete and effective policy action to support growth in the future. His call for more international cooperation comes at a time when the multilateral approach to global policy-making is facing significant headwinds. Whether in international trade or environmental sustainability, truly global problems require truly global policy approaches. The sooner the global actors commit to that reality, the faster will we be able to grapple with the challenges that face our generation. The World Economic Situation and Prospects 2019 report provides a detailed analysis of the driving forces behind the global economic growth. The report, a joint effort of UN DESA, the UN Conference on Trade and Development (UNCTAD) and the five UN Regional Commissions, with contributions from other UN agencies, is expected to issue a clarion call to safeguard and build on the multilateral policy framework. Our future – not only in economic terms – will depend on our ability to work together at this critical juncture. 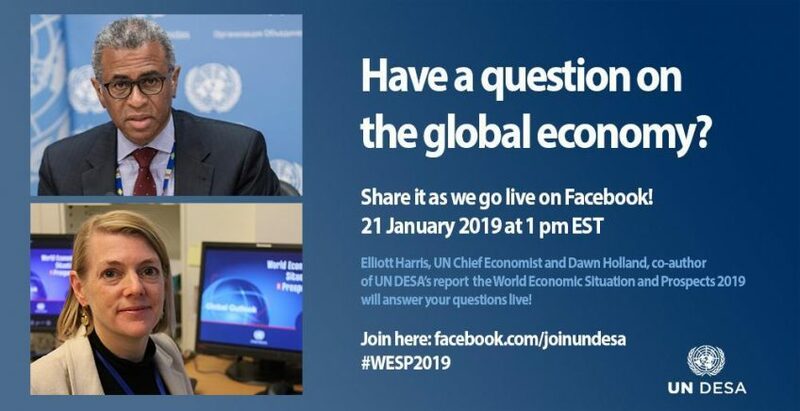 Ask your question about the global economy during our Facebook Live with UN Chief Economist Elliott Harris. Tune in to the UN DESA Facebook page on 21 January at 1.00 pm EST.